Allerton College was the largest secondary school for girls in Sutton in 1900, most of the others being private houses adapted for use as schools. On the opposite side of Lichfield Road from Allerton College was Iona Cottage, now 69 Lichfield Road, where the Miss Culls kept a select prep school. This started in about 1893, and Francis Brett Young was one of the first pupils, sent there because it had been patronised by royalty; in 1901 all six of the boarders were girls of secondary school age, two of them from Ceylon. In an almost identical cottage-style Victorian house of the 1870s round the corner in Anchorage Road was Ashtree House High School for Girls, advertised as a day and boarding school with a kindergarten class for juniors. The Principal was Miss Amelia Tye aged 54, and two teachers lived in, Mary Haigh, 19, the English teacher, and Maud Evans, 22, for music. Most of the pupils were day-girls who lived locally - the three boarders were from Dudley, Somerset and Water Orton. This school may have been the successor to Miss Layht’s Ladies School of 1891, located in Wellington Terrace, the row of houses above the Fire Station in Lichfield Road - she had five girl boarders. Ten years earlier Ashtree House was home to George Masters, a commercial traveller. His wife Fanny, aged 31, had a deaf nephew, 19-year old Albert Rutherford, living in, and she had set herself up as a teacher of deaf children. A governess and five deaf children, aged between seven and fifteen, two girls and three boys, were boarders there, one from Glasgow and one from Bangor in Wales. Another specialist school was Brookdale Academy of Music in Manor Road, where Mrs. Elizabeth Adcocke taught piano, organ, singing and harmony. Nearby in Clifton Road was Avondale School, “The only high class preparatory school in the neighbourhood of Sutton” where boarders could expect “excellent diet and every home comfort”. 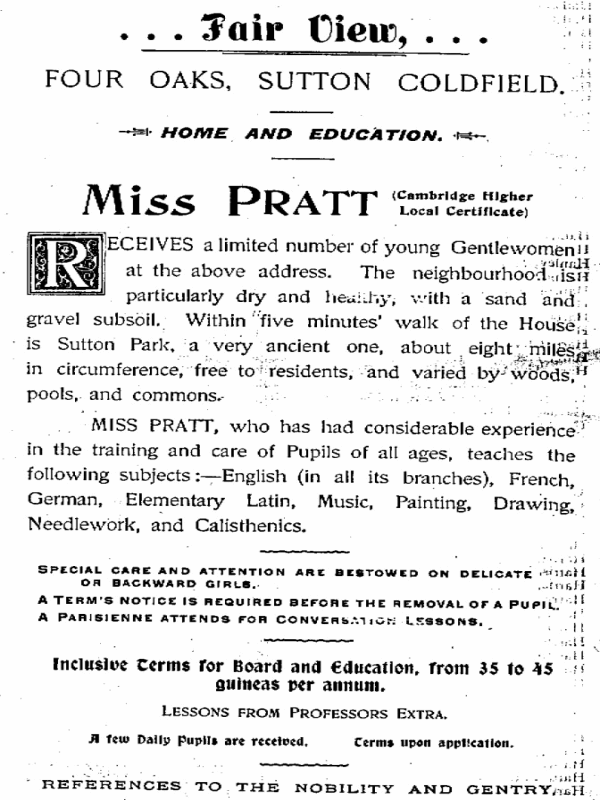 The advertisement for Miss Pratt’s school at Fair View in Walsall Road Four Oaks, targets the newly-rich manufacturers who were moving into the area and moving up to the gentry class. She would “receive a limited number of young gentlewomen” and “special care and attention are bestowed on delicate or backward girls”. English, French, Latin, Music, Painting, Drawing Needlework and Calisthenics were the subjects taught and the fees for board and education were thirty-five to forty-five guineas per annum. “A few daily pupils are received” according to the advertisement, but the census shows only three boarders at Fair View, teenagers from as far away as Stamford (Lincolnshire) and Norfolk, so there must have been a good number of local girls as daily pupils to make the school viable. 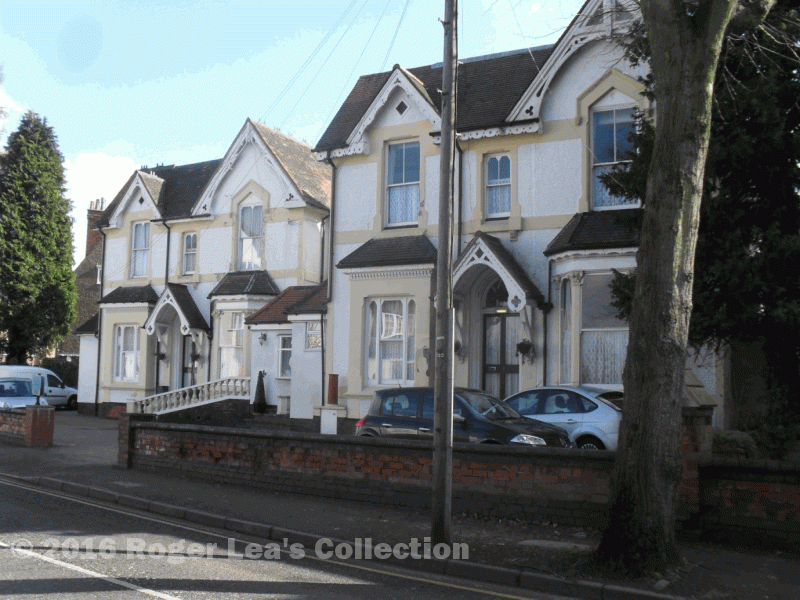 9 and 11 Anchorage Road, 1870s houses in the “Victorian Cottage” style of architecture - one of these was Ashtree House High School for Girls in 1900.